Release Day for “Poisoned” is Finally Here! It’s finally here! 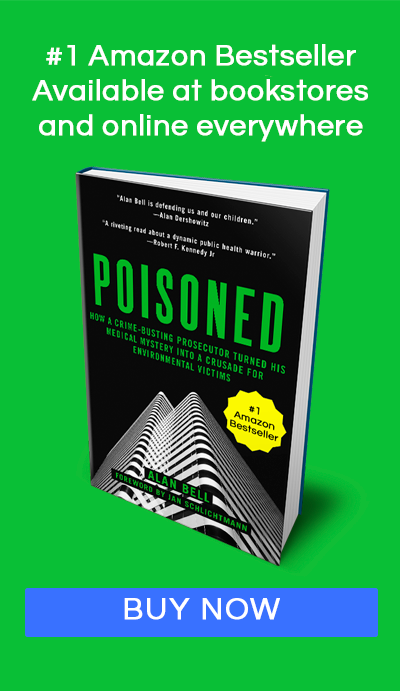 Today is the release of my new book, Poisoned; How a Crime-Busting Prosecutor Turned His Medical Mystery into a Crusade for Environmental Victims! I’m incredibly proud of this work, a culmination of the last 25 years of managing my environmental illness and my subsequent fight to advocate for those who struggle with the same environmental dangers that nearly derailed my life. There are a few ways you can help me in getting the word out about my book, and I would be ever so grateful if you would do one or all of the following this week. Share Poisoned via social media with people in your life who might be interested in what we’re working on! We’ve put together a great ‘share toolkit’ to help. You can simply copy and paste the updates and edit as you wish! After you’ve read the book, post your review to Amazon. Reader reviews are a tremendous boost for the book. Give a “thumbs up” to any good reviews, and a “thumbs down” to negative reviews. Potentially report reviews that aren’t fair reviews of the book. If you order Poisoned before April 8th you will still be able to take advantage of the exclusive pre-order items. I am offering 21 tips to protect yourself from environmental injury, a PDF of 10 chemicals to avoid, a comprehensive online resource guide for non-toxic living and a one hour LIVE webinar Q&A. You don’t have to purchase anything other than the book to get these free gifts. In this post you say you have an environmental illness but on coast to coast you say its not an illness its a environmental injury ? Looking forward to reading your book….congratulations!! Wish I could have kept notes & was organized enough to have done what you have done…with your book. Walked out of my home in ’96 after 8 yrs of exposure to mold & a toxic unprotected remodel where I inhaled multiple toxins & mycotoxins released into the air from a wall-teardown in a moldy bath, resulting in chemical sensitivities, brain lesions & lung nodules…back then I couldn’t even get my insurance to help out after the event, which contaminated all my belongings that I stored for 14 yrs, only to lose them in a storage war due to late payment & inability to get to the sale due to a car break-down. No-one understood or supported my challenges that came from the initial brain injury from the neuro-toxin black molds & the chronic illness that followed while spending my savings renting cars, hotel rooms, storing belongings, & seeing un-insured Integrative & Environmental Medical Doctors who cared & understood toxicity…just not yet the full systemic body/brain damage resulting to all body systems with inflammatory impairment from many toxic indoor MOLDS!! I am still living this nightmare due to the personal family losses, the financial losses & the added expposures of becoming homeless & sleeping in a toxic car, unprotected by safe, non-toxic, non-moldy affordable & tolerable housing!!! Still in this nightmare after 21 years & regressing from any improvements!! This long illness, after the neurological CNS/immune injury deserves on-going appropriate, insured Medical care &the elimination of any statutes from the time first harmed for the purpose of saving a life from early death, restoring some of the many losses & compensating the long, unsupported, disbelieved & disrespected suffering for such victims, due to the total REJECTION of such poisoning by the Medical World & all other protective Insurance organizations who aided in these tragedies!! !~I applaud your effort & can’t wait to read it!! My saving grace is that my 3 children were away at college mostly during the worst of it….’95-’96 & I thank God for that!!! Wow. Unfortunately, you are NOT alone. Good and bad. I hope you find health soon. James, it is complicated. Speaking from personal experience, It is an injury and an illness. The injury comes first, the illnesses follow. You do get additional injuries because of the developed sensitivities. Rinse, repeat… In short, it is hell. Don’t let the terms confuse you. It is not a chicken and egg question. Exactly. Thank you for sharing this with James and everyone. Environmental illness often starts with an environmental injury, a chemical exposure, also called an environmental insult. It is a trigger, it initiates one to a cascade of chemical sensitivities as one’s system becomes more and more overwhelmed. In my case it was a pesticide exposure gone wrong. And then my MD found I was predisposed because the P450 cytochrome enzyme clearance pathway in my liver was weak, compromised. I have gotten a lot stronger and can go anywhere now, but heavy hits of chemicals can still make me very ill. This is very true and exactly what happened in my case. Thank you for sharing! After going to 3 different specialists and testing negative for allergies (skin poke test). Enduring a chest xray and throwing up the barium used for xrays. At least it didn’t make my heart stop like the liquid dye contrast did years before on another chest xray I had. Finally the allergist diagnosed me as having nonallergic rhinitis. Ironically I worked at a health department years ago they remodeled several times it was a really old building. On another ocassion the health deptartment was giving out free radon test kits and employees were told we could not test building for radon. Oh well it happened to many years ago to know for sure if the remodels or chest xray incident had anything to do with it. Icing on cake was when health depth sent me on company time to have 1st xrays I ended up paying the hospita billl.because I did not want to get them angry with me and find a way to fire me. I only hope some day I will get better, the worst part is most people will say it is in all in your head…it would be nice if it was that simple. Thank you for sharing your story. There are answers out there for your health, keep searching. Alan, Am ordering your book! It’s two years since I moved into an apartment that had just had new carpeting installed. I knew about off-gassing but hoped that by keeping windows open all summer it would subside. But I think I’m still getting the harmful effects: exhaustion, malaise, etc. How harmful are the chemicals in new carpets and would it be best to still move out?